Alan Moore’s Miracleman, original issues 4,5,6,7 as well as Miracleman3D issue 1, with 3d glasses that came with the issue. Tim occasionally comments on items here on Marquand.net and I feel like I’ve gotten to know him relatively well and I was happy to see that he won the bid. Not long after the auction closed, I received an email from him asking for my home address. As crazy as it sounds, he was wanting to send the game to me as an early Christmas present for the Marquand household. I was speechless! I’m extremely grateful for the gesture and it’s difficult to find the words to express my gratitude. Tim, I thank you and my family thanks you for your extreme generosity. There’s hardly a day goes by that I’m not amazed by the generosity and kindness shown by those on Boardgame Geek. What a fantastic group to be a part of. Late Saturday night, we’d gotten home from a trip to Indiana and there, waiting for me on the front porch, was the game. 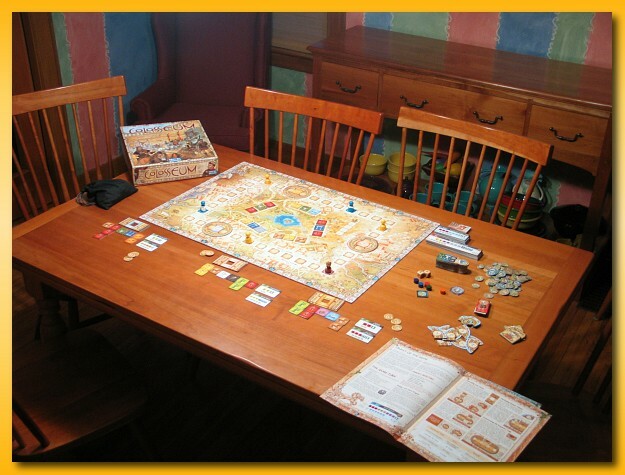 After some yard work and clean up around the house today, plus packing away Valdora still set up on the dining room table, I couldn’t wait to set up Colosseum and start reading through the rules. Unfortunately, we’ve got some things going on tomorrow that will keep me from playing any test rounds tonight and I’ll have to pack it away before bed. But you can rest assured it’s coming out tomorring so that I can get the rules down for the upcoming Buckeye Game Fest later this week. My copy of Valdora arrived today along with a couple of games (A Castle for All Seasons and Sushizok im Gockelwok) I’ve got earmarked as give-aways for the Great Lakes Games convention coming up in early November. I looked around numerous places for Valdora and given that it does not have a US publisher it was more difficult to find than your run of the mill Euro. However, Abacus, a German company, has done an excellent production job with the game and given that the rules and cards include the English translation I’m not sure a US publisher is necessary. 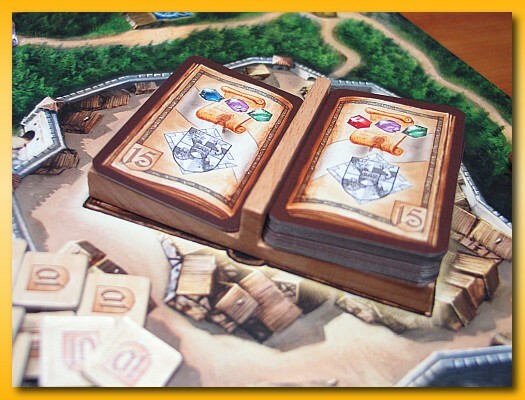 Valdora is a Michael Schacht creation (Coloretto, Zooloretto, China, Hansa, …) featuring a pick up and deliver mechanism and some very unique wooden “books” that are used throughout the game to reveal cards to the players. I pulled out Java tonight and played a few rounds for three in solo mode. It’s been a very long time since I’ve played but the richness of the experience came back very quickly. 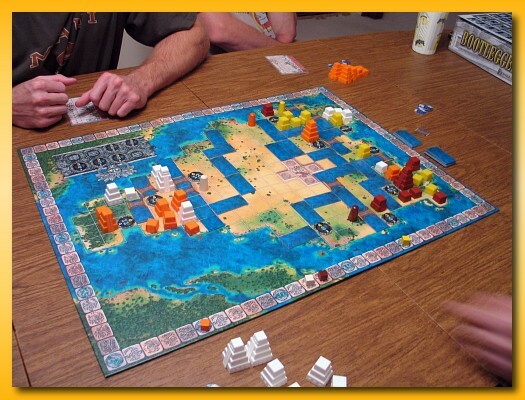 My recent game night featured Mexica and with the “mask trilogy” juices flowing I just couldn’t resist blowing off the dust and seeing if it still felt like it did. I remember it feeling heavy, thinky, analysis paralysis prone, and relatively complicated. But with so many different games under my belt now, it’s really not that complicated. 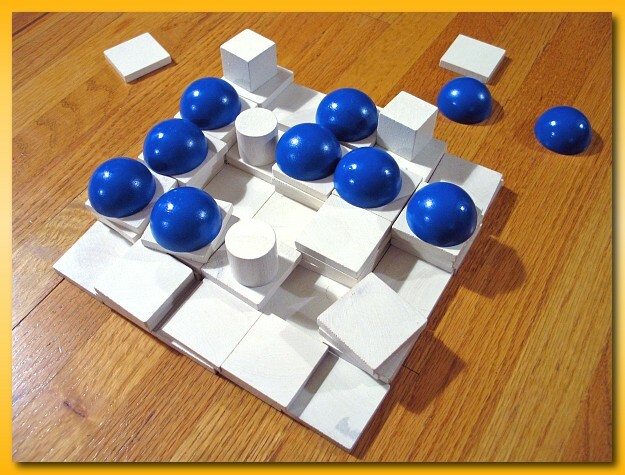 Now, playing well is another matter but the mechanics are downright straightforward. I need to get this to the table soon. I’ve recently turned on a chess-playing coworker to Hive and his mentioning today that his order was on the way got me thinking about other two-player games that he might like. I’m not much of a 2-player abstract lover and unfortunately I don’t have any of the Gipf Project Series in my collection so I opted for pulling out Santorini for a quick run through and a solo play refresher. Taking it into work and see if he likes it. In July I was contacted by the Marketing Director of Sophisticated Games, the original publisher of Ingenious. He’d seen and played my online implementation of Ingenious and was convinced that it provided a needed “try before you buy” experience for his customers. He introduced me to a member of the editorial department at Kosmos and over the course of a few weeks and numerous emails, the three of us discussed how best to position my implementation of Ingenious as the official “try before you buy” implementation for prospective customers for the two companies. We agreed that I would host the implementation at Marquand.net and we would create bidirectional links to the game from all three sites. However, before we could finalize the agreement, the implementation needed to provide multi-language support (namely German). 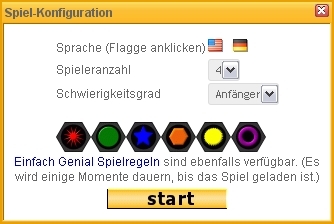 So, over the last few weeks, I’ve changed the code so that the initial splash screen provides two language options (depicted as country flags) and when selected, the language content of the game changes appropriately. Given my changes, I can support any number of languages quite easily so if you would like another language supported, please send the suggestion my way. I’d like to thank the efforts of my Sophisticated Games and Kosmos partners for their efforts at working through, at times, the rather mundane details but persevering through my incessant questions, i-dotting, and t-crossing. I’m proud of the results and I’m convinced the user experience has been greatly enhanced. I look forward to working with Sophisticated Games and Kosmos in the future whenever the need arises and in whatever capacity is deemed appropriate. We met at Jared’s house last night for the September 2009 installment of Analog Game Night. Thanks for hosting Jared. Jared had some home brewed beer that was hot off the presses and ready for the taste test and like a good gamer, I had to oblige. Awesome job Jared and much thanks for sharing! We started the night with five and we chose to play my copy of Small World. 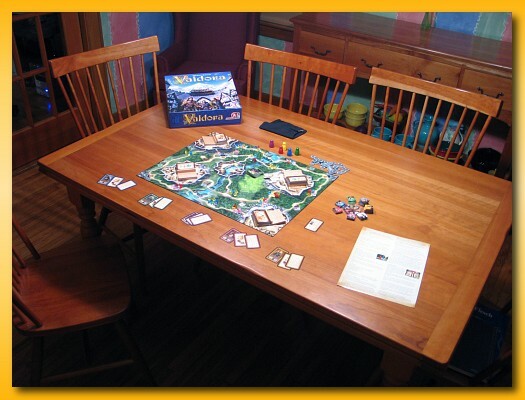 I’d only played Small World as a two-player game with my son Noah so I was anxious to try it out with more. 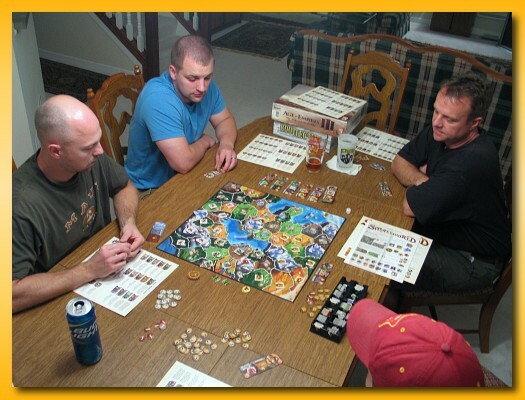 One can usually judge the clarity of the rules by counting the number of pages of questions in the BGG forums and as of this post, Small World has a staggering 18 pages (10 forum posts per page) of questions. It didn’t surprise me that upon set up, we ran into a few soft rules areas in which I was weak. 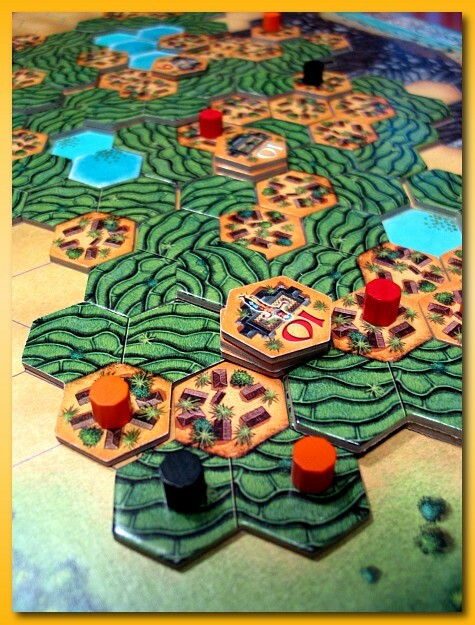 There are regions of the 5-player board that appear to have both water (dark area) and mountain in the same region (near the bottom of the board). It didn’t become an issue that needed resolving but I’d think that each region can only be of one type. Since the mountain is the only clearly visible feature I’d side with declaring it mountain and be done with it. During the game some questions arose about special power etc that I hope were resolved appropriately. I do know that I learned more about Sorcerers. I’d been playing wrong in that I’d missed that the area must contain only one token of your opponent when using the Sorcerer’s power and the token must be active. We played it correctly last night BUT still incorrectly in that I thought you still must add more of your own tribesmen from your hand to attain the correct number of conquering force. That approach proves to be more complicated than it really is. The Sorcerer simply allows you to turn a single, active, and unbivouacked tribe into a Sorcerer taken from the tray. Done. You put the conquered token in the tray and put out the Sorcerer and you’re done…area conquered. Oh well, I’ll get at least that part right next time. I didn’t enjoy the game near as much with 5 players as I did with 2. I suspect the sweet spot is with 3 or 4. The down time increases dramatically with each addition (at least with my group) and there’s really not much you can do between turns. Requiring you to redeploy conquered troops (minus the losses) onto existing regions is a nice feature that does keep you involved in other player’s turns (at times) but for the most part, you can go get a beer and some food between turns. We lost one player after Small World and after some chit chat about work stuff we pulled out a blast from the past, Mexica. I’d not played in a very long time and I hope I didn’t murder the rules too badly. I usually play Mexica very poorly falling into the same trap every game of trying to retain dominate in too many areas against too many different opponents. I made a conscious effort to limit my opponents this game and did better than usual. In other words, I didn’t end up a distant last. Mexica is one of those games that doesn’t get played much but every time I play it, I’m reminded how good it is even if I routinely play poorly. Sure, it’s a bit chaotic with those bridges and the water travel but still a solid game. The costs of actions and the number of actions you can expend per turn are honed to such a keen edge you’d think the game a design of the mathematical brilliance of Knizia but you’d be wrong. 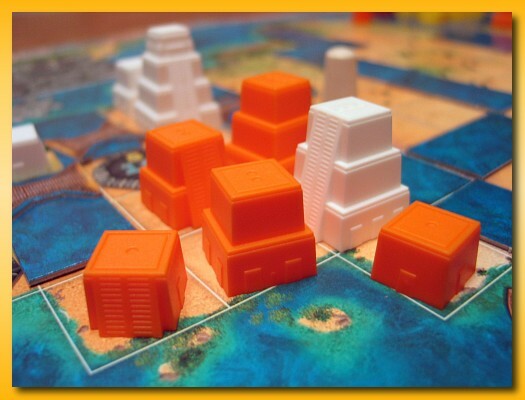 Mexica, as well as the other “mask” games (Tikal, Java, and the sometimes thrown in for good measure Torres) are all the product of the creative minds of Wolfgang Kramer and Michael Kiesling. 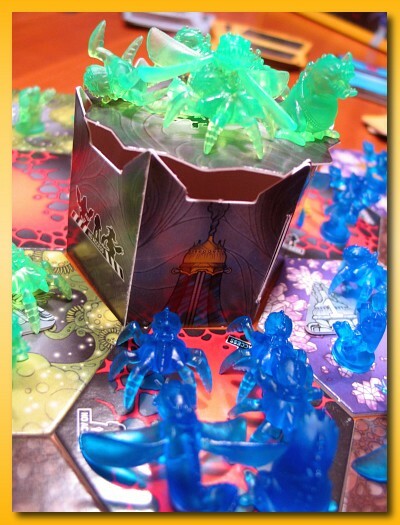 All four games feature the clever artistic feature of beginning the game with a “clean” board but games end, you’ve constructed something that looks pretty cool in it’s own right. Those unaccustomed to games such as these will just look in wonder at how you could play a game on what would otherwise look like something kids have been playing “city” with. Getting there is the battle and having it look good in the end is just icing on the cake. Thanks Jared for hosting and as usual I’m looking forward to next time. 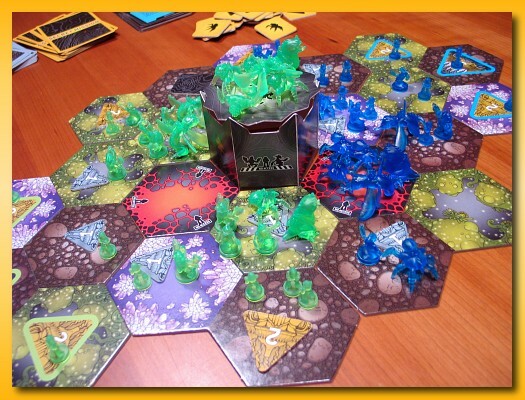 Noah and I have been enjoying Small World recently but he wanted something a bit different and suggested Nexus Ops. It’s been a very long time since we’ve played so I dusted off the box and set up for a two player Human, Fungoid, Crystalline, Rock Strider, Lava Leaper, and Rubium Dragon throw down. He and I are the only ones in the house that like to play the game given the alien/mining/battle theme so we only get to play 2-player but we still have fun with the dice-fest. Holding the Monolith can be key for gaining lots of extra Energize cards which give you additional one-time-use “special” abilities. However, holding the Monolith isn’t necessarily the only goal. At times, a massive attack from the monolith and it’s surrounding hexes can decimate gathered enemy troops caught unaware. Knowing when to make attack, retreat, and when to “turtle” is key. Most of our games become a mad rush to the Monolith leaving our backsides wide open for a Rubium Dragon fly in from the Monolith…but it’s worth the risk. Our eventual build up along our mutual fronts make for horrific battles with excessive losses on both sides. Basically…lots of fun working through the alien carnage.